Microsoft are continuing their giveaway spree of OneDrive storage, this time offering users another 100 GBs (valid for one year) of free online storage simply by proving they have a DropBox account. 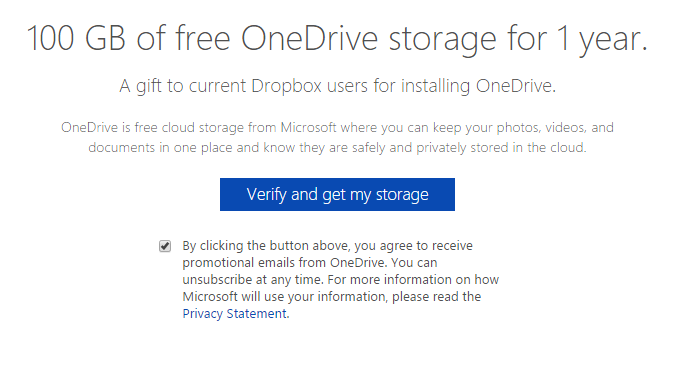 Presumably this is an attempt by Microsoft to entice users to switch from competing services to OneDrive, and the free storage certainly doesn’t hurt. To claim the storage you have to upload a “get started with OneDrive” document to your Dropbox account that helps verify your account. Thanks for the tip Alvester! Thanks for the info! I haven’t used my Dropbox account since 2012 due to the measly 2GB of storage. I had to reset my password but now after reading your article, I have 230 GB in my personal OneDrive account so all is well that ends well. I also have 2 Office 365 accounts in the TB range. As a side product, I rediscovered old pictures and videos long thought lost….they were in my long forgotten drop box account. Those files are being uploaded to OneDrive as I type.